Anyone hoping to put on the year’s most impressive Halloween-themed light display should probably just give up right now. 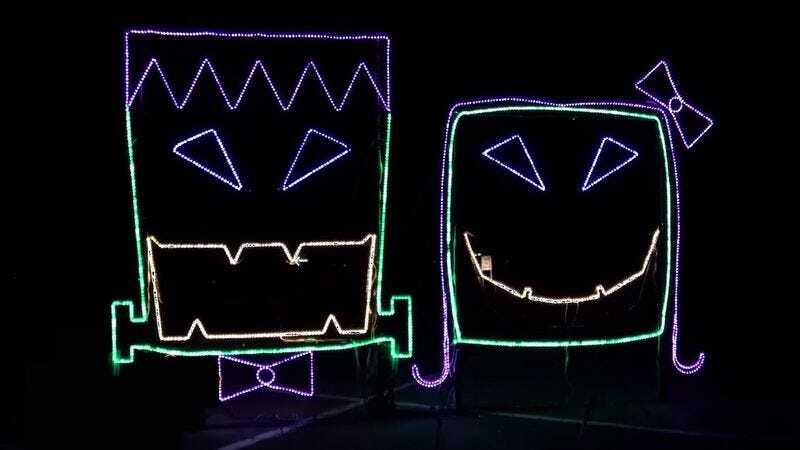 There is very little chance of topping what Creative Lighting Displays has achieved for an event called Thriller Nights Of Lights, currently running at Hank Aaron Stadium in Mobile, Alabama. Credibly billed as “the only show of its kind in the country,” this is a gigantic, drive-through light show synchronized to music that plays through visitors’ car radios. The fact that the display is constructed within a stadium should give readers some idea as to the enormity of its scope. It takes about half an hour to see the whole thing. The following four-minute video, set to Michael Jackson’s “Thriller,” gives curiosity seekers a sample of the unusual event. Unless they can watch it on a Jumbotron, however, it probably doesn’t do justice to the real thing. This lighting display focuses on the standard icons on the Halloween season: bats, witches, pumpkins, giant spiders, cemeteries, floating eyes, monsters, and a random guy in overalls standing on his head. The actual lip-syncing is done by a creature that is somewhere between a jack-o’-lantern and Boris Karloff’s character from Frankenstein. Instead of his usual screeching bride, this monster seems to have settled down with a nice, easygoing pumpkin-headed woman who stands by his side, smiling beatifically. And all through it, there is Jackson’s music, as funky and infectious as ever.